There are six stations for you and your lab partner to visit on your lab tour today. Some will be guided tours with a TA or faculty there to help you and others are self-guided, leaving you and your partner to try things on your own. Your visit to each station will last 10-15 minutes. It doesn’t matter which station you visit first but you must visit them all before you leave today. Your lab practical next time will assess your mastery of each station. Using your P20, measure 10, 15 and 20 μl of the 0.01% XC stock solution into the bottom of three cuvettes. 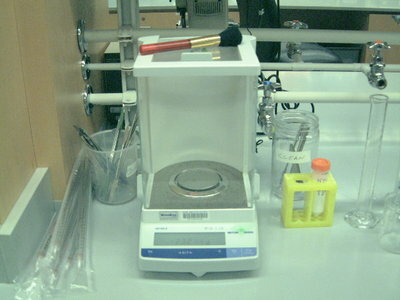 Using your P1000, add water to bring the final volume to 1 ml (=1000 μl). 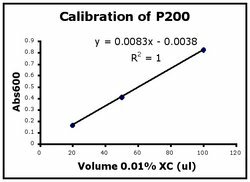 Using your P200, measure 20, 50 and 100 μl of the 0.01% XC stock solution into the bottom of three more cuvettes. Using your P1000, add water to bring the final volume to 1 ml. Using your P1000, measure 100, 200, and 400 μl of 0.01% XC solution into the bottom of three more cuvettes. Add water to bring the final volume to 1 ml. With a gloved hand or with a piece of parafilm over the lip of the cuvette, invert each cuvette several times to thoroughly mix the contents. Visually compare your dilutions to the reference ones. If time permits, you will read the absorbance of your dilutions in the spectrophotometer so do not throw them away. 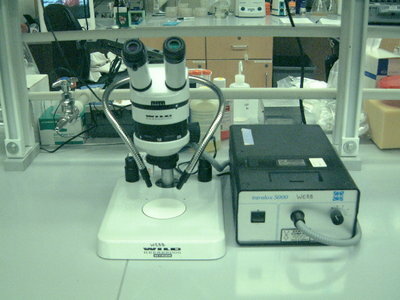 Today you will be shown how to use each of the microscopes in the main lab and you will use them to compare three cell types. You will be asked to focus a sample during the lab practical next week. 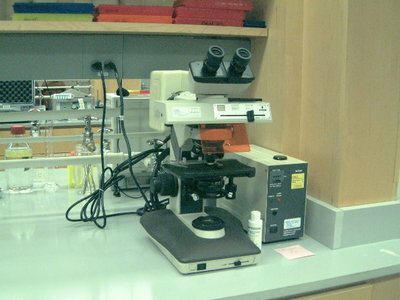 Our lab is beautifully equipped. We have a fume hood for work that generates hazardous vapors. We have a back room where dishes can be washed and material can be decontaminated. The backroom also has an icemaker, a sink with ultrapure water and several CO2 tanks that feed into the incubators in the tissue culture facility. The tissue culture facility has three hoods with germicidal lamps, six incubators for growing eukaryotic cells, two inverted microscopes, and a tabletop centrifuge. 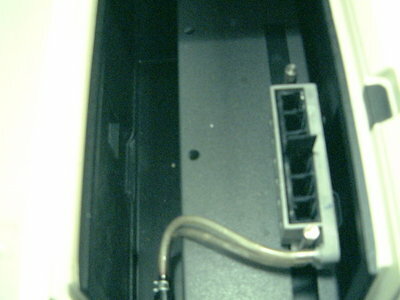 It also has a waterbath for warming up solutions and a refrigerator for keeping them cool. Today you will be shown how to use the autoclave and what it does. You will also be shown some key features of the tissue culture facility, including the different types of waste disposal containers (for trash, biohazard, sharps). More formal training in tissue culture techniques will occur as part of experimental module 1. Put on gloves to weigh out solids. This protects you from the chemicals and the chemicals from getting contaminated with anything foreign on your hands. Sorbitol is not a dangerous chemical. Measure approximately 80 ml of ultrapure water into a 100 ml graduated cylinder. Read the volume in the cylinder by bringing it to eye level to see where the meniscus reaches. Add the water to the beaker with your sorbitol. Add ultrapure water up to 100 ml using a plastic disposable pipet. To open the pipet, hold it in one hand. With the other hand puncture the wrapper by pulling it against the top of the pipet (not the end with the tip!). Put the exposed end of the pipet into the pipet aid or bulb then withdraw the pipet from the rest of the wrapper. Place the tip of the pipet into the ultrapure water and withdraw enough water to “top off” your solution. Dispense the water into your sorbitol by submerging the tip of the pipet into the solution and releasing the water from the pipet. Stop when the graduated cylinder reads 100 ml. Extra water can be discarded into the sink and the used pipet can be discarded in the sharps waste container that is under the bench. Since you will measure the pH of your solution you should pour it back into your beaker and put it on a stir plate. Start the stir bar gently spinning. If you did not have to measure its pH you would move it to a bottle for storage. Place the electrode 1/2 way into the 15 ml conical tube with calibration buffer pH 7.0. Press the “read” button. 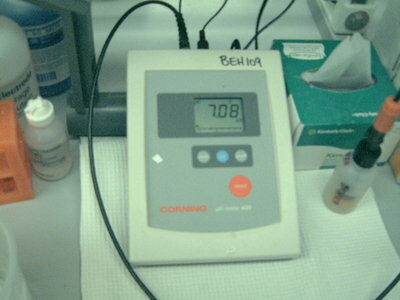 Wait for the reading to stabilize and note how close it is to pH 7. Press the “read” button again to put the pH meter on standby. Rinse and dry the electrode then place it in your sorbitol solution. Hold the electrode at the edge of the beaker and be careful not to let the stir bar hit (and break!) the electrode. Read the pH of your solution and let one of the teaching faculty know what you have found. 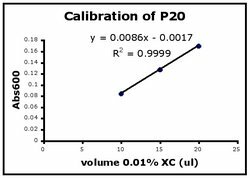 In this assay you will calibrate your pipets by measuring the absorbance of the XC dilutions you made. Beer’s Law, which relates absorbance to concentration, will be derived as part of experimental module 2. Here, you’ll see that the graph of absorbance versus volume of 0.01% XC is a straight line….or at least it should be! Confirm that the machine is set to read absorbances at 600 nm. 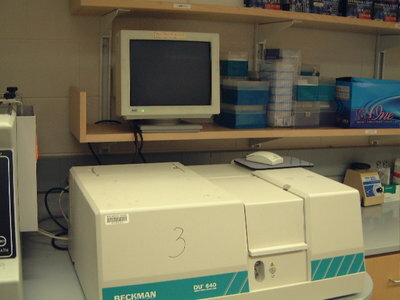 Put your blank into the spectrophotometer at position 1, which is furthest back in the instrument. Be sure the window of the cuvette and not the frosty sides are in the light beam that travels from left to right. The XC dilutions can be washed down the sink and the cuvettes can be discarded in the sharps bin. 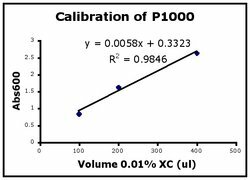 Use Excel to prepare a graph of absorbance versus volume of 0.01% XC. Some sample graphs are reproduced below and you should generate similar ones with your data. Be sure to include a trendline, displaying its equation as well as the r-squared value on the graph. The r-squared value reflects how well the data points fit the equation. A perfect fit will give an r-squared value of 1. If you are uncertain how to make such a graph using Excel, be sure to ask for help. We will use Excel a lot this semester, in particular during experimental module 2. 1. Review today’s lab to prepare for the lab practical that you and your partner will take together. 2. Complete the Chemical Safety Training on Athena. 3. Get a lab notebook. It should be bound and have duplicate, numbered pages. You can choose the style with carbon sheets or the carbon-less kind used in 5.310. 4. Complete the student registration/questionnaire to turn in next time File:BE109StudentReg S06.doc. 5. Register for an account on OpenWetWare. Once you get an account familiarize yourself with the wiki by reading Using OpenWetWare. Put some information on your user page. 6. Read the introduction for the DNA engineering module: an experiment that you'll start next time. This page was last edited on 7 May 2008, at 13:50.